In 1988 I spoke to one of the great figures in computer gaming about “the future of games”. 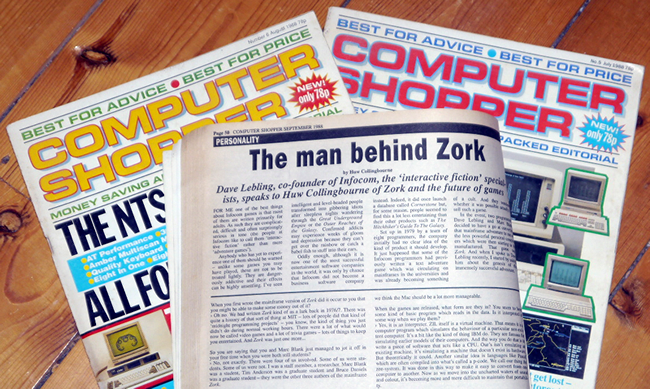 Dave Lebling was a founder of the Infocom games company, which created games ranging from the famous Zork trilogy to an adaptation of Douglas Adams's The Hitchhiker’s Guide To The Galaxy. Of course, neither of us back then had any real idea of how the games industry would develop over the next 25 or 30 years. Back then I played Zork – a text-only game which ran nicely on my PC with just 512K of memory. Today I am playing the photo-realistic, fast-action Assassin’s Creed Syndicate on a PC whose graphics card alone boasts 6 Gigabytes of memory in addition to the 16 Gigabytes of the PC’s system memory. In 1988, mere megabytes of memory seemed like a futuristic dream. The idea that anyone would ever have gigabytes on their graphics card would have seemed ridiculous. Here is the introduction to my 1988 interview with Lebling. The interview itself will follow shortly. FOR ME one of the best things about Infocom games is that most of them are written primarily for adults. As such they are complicated, difﬁcult and often surprisingly serious in tone (the people at Infocom like to call them ‘interactive ﬁction’ rather than mere ‘adventure games’). Anybody who has yet to experience one of them should be warned - unlike some games you may have played, these are not to be treated lightly. They are dangerously addictive and their effects can be highly unsettling. I’ve seen intelligent and level-headed people transformed into gibbering idiots after sleepless nights wandering through the Great Underground Empire or the outer reaches of the Galaxy. Conﬁrmed addicts may experience weeks of gloom and depression because they can’t get over the rainbow or catch a babel ﬁsh to stuff into their ears. Oddly enough, although it is now one of the most successful entertainment software companies in the world, it was only by chance that Infocom did not become a business software company instead. Indeed, it did once launch a database called Cornerstone but, for some reason, people seemed to find this a lot less entertaining than their other products such as The Hitchhiker’s Guide To The Galaxy. Set up in 1979 by a team of eight programmers, the company initially had no clear idea of the kind of product it should develop. It just happened that some of the Infocom programmers had previously written a text adventure game which was circulating on mainframes in the universities and was already becoming something of a cult. And they wondered whether it was possible actually to sell such a game. In the event, two programmers, Dave Lebling and Marc Blank, decided to have a go at converting that mainframe adventure to run on the less powerful personal computers which were then starting to be manufactured. That game was Zork. And when I spoke to Dave Lebling recently, I started by asking him about the genesis of that immensely successful adventure.